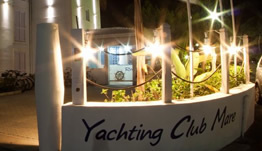 The Yachting Club Mare 3 star hotel prides itself on offering its guests a friendly and high level of service. Our highly trained multi-lingual staff are welcoming and keen to give guests personal care and attention in addition to normal hotel services you may expect. To this end, our reception staff can provide valuable tourist information about things to do in the area in addition to providing assistance with reservations and excursions to the Aeolian Islands,Taormina, Cefalu’, Palermo and Etna in addition to the surrounding sites. Of course there is plenty to do right here with all manner of water sports and activities possible from our private beach which also enjoys sun-bed, umbrella and snacks services. 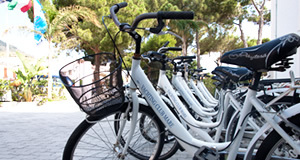 Guests can even hire bicycles, cars and boats from us to explore Sicily with total freedom and our snack bar and sun terrace services mean that you can also recuperate from your exertions. We even offer a currency exchange service, a tranquil reading room, refreshment table service, luggage storage and fax & photocopying services in addition to our free Wi-Fi internet connection will ensure that you can keep connected to your friends, family and information about the area. Check in is available between the hours of 3pm and midnight whereas check out ideally takes place from before 10am. Children under 2 years old can stay free of charge when using existing beds and we can also offer children’s cots/cribs for a small surcharge. So what are you waiting for? Make your booking today using our completely secure online booking system! A particular favourite of our guests is our charming Aeolian terrace where visitors can spend pleasant evenings sipping cocktails against the backdrop of gentle music and the rhythm of the waves. Our staff are also pleased to offer a complimentary sweet &savory breakfast served either in our breakfast room, in our garden area (in the summertime) or directly to your guest room using our room service. 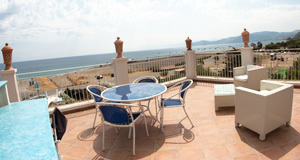 We also enjoy an arrangement with a local restaurant to provide quality traditional cuisine.